to graduate from the University of Wisconsin-Madison. Ada Lois James lived in Richland Center, Wisconsin, for her whole life. Both of her parents actively supported rights for women, including the right to vote (suffrage). Her mother, Laura Briggs James, helped start the Richland Center Woman’s Club, which may have been the first organization in Wisconsin to fight for women’s suffrage. Her father, David G. James, was a state senator who introduced a bill that led to a statewide vote (a referendum) in 1912 about amending the state constitution to allow women to vote. But only men could vote in that referendum, and a majority of them voted against the amendment. Ada James graduated from the University of Wisconsin. She taught school for a while but spent most of her life working as an activist. She served as vice president of the Wisconsin Woman Suffrage Association when Olympia Brown was the organization’s president. In 1911 she organized the Political Equality League of Wisconsin, and she served as its president for two years. She was a leader in the campaign for the state women’s suffrage amendment. After that amendment failed to pass, James and her father both continued to work for women’s suffrage. When the U.S. Congress finally approved a constitutional amendment guaranteeing all American women the right to vote, all of the states had to “ratify,” or give consent to, the amendment to make it official. 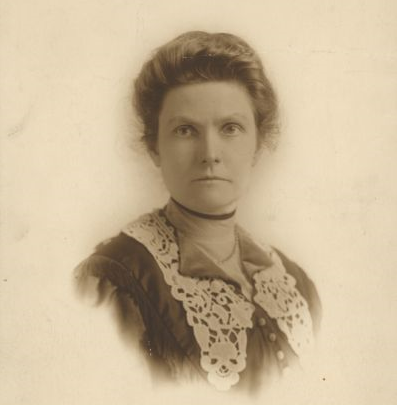 James campaigned to get Wisconsin to ratify the 19th Amendment, and her father was the special messenger who took the ratification papers to Washington, D.C., in June 1919. James was against the U.S. getting involved in World War I and was a member of the War Resisters’ League. Throughout the 1920s she was active in movements that promoted pacifism, birth control, and prohibition. She managed a trust fund that her father set up to help children in need, and she helped start and was chairman of the Children’s Board of Richland County. In 1922 she became vice chairman of the Republican State Central Committee and president of the Wisconsin Women’s Progressive Association. She died in 1952 at the age of 76. McBride, Genevieve G. On Wisconsin Women: Working for Their Rights from Settlement to Suffrage. University of Wisconsin Press, 1993. Photo courtesy of the Wisconsin Historical Society archives, image ID 130061.